Will the 2018 CNU Festival be remembered as the most successful festival ever? It might be true if it was for the celebrities alone, as there were over four thousand people in the crowd who gathered to see them. Although some students showed satisfaction with the event compared to previous ones, it has left something to consider about the purpose of the annual festival, called “Yongbong Daedongpuri.” Top celebrities would increase student participation but could not bring many students together and promote their community spirit through the festival. This is a chronic problem to be solved further. In this article, the Chonnam Tribune listened to students’ voices looking back at the festival that took place from October 4 to 5. 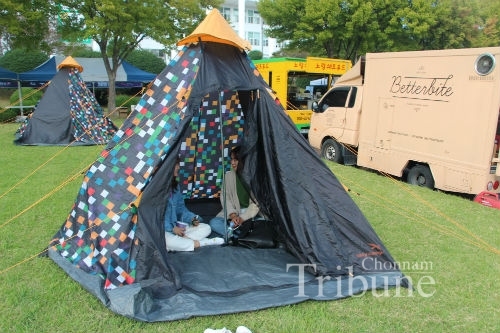 The festival title was “Bet (sounds like ‘light’ in Korean)-tween”, which indicated that CNU members would shine brightly when they come closer at the festival, following the meaning of the word “daedongpuri” that means all people coming together with the community. During the two days of the festival, some programs and events such as ‘The Haunted House’ and ‘Escape from the Room’ especially received a good response from participants, all of whom formed each team and enjoyed themselves during those events. Bongji and the road to the East Gate were filled with many booths that students could easily visit to join during the festival. 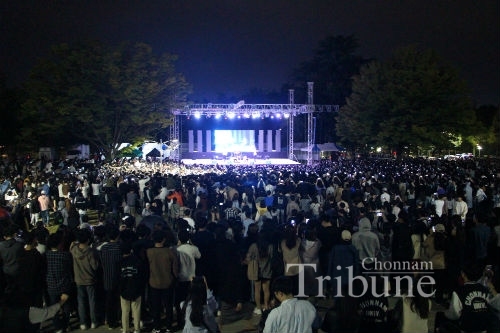 However, CNU’s distinct and unique features were not found in the festival, which was not by CNU students. It was more or less the same as any other event at any university. Even if some clubs held their own events at the CNU Night Market in the East Gate area, more than half of the space was taken up by many off-campus vendor booths, such as food trucks and shooting games. Many students were unsatisfied with the same programs and contents at the festivals in past years. That seems to be the main reason for little student participation in the festival. Yu Yeong-jae (Senior, Dept. of Chemistry), director of the Festival Planning Group (FPG) of the General Student Council, mentioned that they could not reflect more opinions of students, compared to last year’s festival. They failed to collect a variety of opinions of the annual festival from students in advance and also failed to organize programs and events that could bring students together in distinct yet interesting ways. It was certain that the invited celebrities were the best way to attract and bring many students and local residents into the festival this year. It turned out that about 67 million won for inviting two famous singers was used, which took up 3/4 of the total budget for the festival of about 90 million won. Actually, their performances were the most significant events which students wanted to visit and enjoy with their friends. Meanwhile, other programs and events were left behind the celebrity power. The Talent Show of CNU Students that was scheduled behind Sunmi’s performance on the first day was a typical example. Lee Ga-young (Junior, School of Applied Chemical Engineering) attending the event pointed out that there was a lack of materials to promote the performance schedule of CNU clubs. “Some CNU clubs are so famous that they even have many fans, but I think few people knew whom they were when they were performing.” As she stated, this year’s festival promotion materials were generally focused on each singer’s performance schedule. The FPG should seek new and effective ways to increase student participation, instead of jumping on the wagon of celebrities, in order that the festival can be a special event for students and members of CNU to promote a community spirit through diverse activities. “We are also CNUians,” concluded two foreign students in the video clip projected at the Opening Ceremony of 2018 Yongbong Daedongpuri. However, questions are left whether they were really embraced as CNUians. Throughout the festival period, there were no promotional materials in English for foreign students to join. This is one of the most chronic problems that the festival has had, but at the same time something that the FPG had never noticed. This Tribune reporter had met some foreign students during the festival days and asked them how they were enjoying it. Omonov Khumoyun (Sophomore, Faculty of Business Administration), playing classic arcade games with his friends, said, "I was just passing by near the Central Library, and only then I found this event. There is no other way to get to know what else is being held on campus.” Other foreign students expressed a deep dissatisfaction that nobody told them how to apply for certain events, and that they had severe language barriers during the festival. It was apparent that they were implicitly excluded from the festival. The CNU Festival should have functioned as a place for more CNU members to get together during the festival period. Yoon Se-jin (Junior, Faculty of Business Administration) gave an opinion about the Festival. ”Even if the festive mood was well formed, more students should attend our festival and the FPG needed to thoroughly check the quality of events and foods served at the festival.” Director Yu also expressed deep regret that too much focus was given on the famous singers, not other programs they had prepared. “I think we need to change students’ recognition about the fundamental purpose of the festival in order to make our festival sustainable in the future,” Yu said. As student interviewees indicated in common, the festival needs to be composed of CNU-oriented and student-creating programs. Ryu Jae-han, a professor of Dept. of French Language and Literature, evaluated the 2018 Yongbong Daedongpuri as ‘Nothing CNUians‘. He had conducted several pieces of research about the changing culture of the CNU Festival. Stating the example of the University of Coimbra in Portugal, he added, “A festival held there always has a certain concept and every performance is given by students, not by top celebs.” Professor Ryu suggested the future festival combine cultural heritages of CNU and creativity of more CNU students. If the FPG could collect more opinions from students and combine them with creativities together, Yongbong Daedongpuri is expected to meet its fundamental meaning of ‘getting together’ in the near future.